MAN OF SIN: Preparations are being completed for the man of sin. 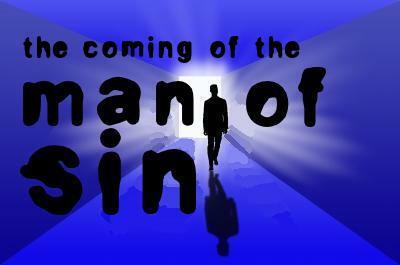 The man of sin will arise from the midst of the apostate church. The modern, assembly line eschatology churns out soothing fable after soothing fable about the end times. The intent is to lull believers to sleep. Don’t be deceived: the man of sin will arise from within the apostate Church. Now we know that Paul wasn’t referring to a temple built by hands. Jesus said as much. So the man of sin will not sit in a temple made with hands; i.e., a third Jewish temple. Oh, no doubt some future imposter may indeed perform such an act–BUT God’s Word would not refer to such a building as “the temple of God.” Paul used “the temple of God” to refer to the church. So, the man of sin–the REAL man of sin–will arise from the midst of the Church, the apostate Church. The man of sin will then steer that apostate Church to great power. He will not create a new Church: he will pervert the one already in place. This perversion is taking place at this moment in churches across America, before our very eyes. Jesus warned us. Paul warned us. John warned us. But pew-sitters used to compromise and walking by sight are convinced they are living holy lives, convinced they will be a “chosen generation;” convinced they will be part of a great end times army that God is raising up. The army they’re a part of, the church they worship in or the man they will follow: they will not be from God. They will be counterfeits from Satan. But the apostate Church will believe they are honoring God Almighty, not the dragon. It’s because they refuse to read their Bibles. Reading, they refuse to believe. Jesus warned that many would come claiming to be the Christ. These numerous lesser antichrists who were already in the world, as the Apostle John explained in 1 John:2:18 would prepare the way for the real Antichrist who would appear in the last of the “last days.” Behold the ultimate deception: Satan posing as God, Antichrist masquerading as the true Christ, and not just the world but an apostate church as well totally taken in by the bold fraud. Instead of a frontal assault on Christianity, the evil one will pervert the church from within by posing as its founder. He will cunningly misrepresent Christ while pretending to be Christ. And by that process of substitution, he will undermine and pervert all that Christ truly is. Anything less than such a diabolically malevolent strategy would be unworthy of Satan’s foul genius. Who can doubt that this very thing has been happening? Who hasn’t seen it with their own eyes? There are many antichrists in the world–and they are all preparing the churches for the man of sin. Many Christians believe the man of sin will wear a scary costume or carry a large sign identifying him as the man of sin. Many in the churches are deceived by a counterfeit Holy Spirit. The journey to a counterfeit Christ is not such a long one after one has begun taking the steps. What does the Bible say about demonic/satanic miracles? When it’s pointed out the Bible states very clearly that Satan and his minions will do great miracles, signs and lying wonders in the last days, people walking by sight want to engage in a discussion. But this argument is not with the one who pointed out the source of the coming signs and wonders. Their argument is with the Word of God. This is the argument from the Garden: Hath God said? Of course God can do miracles. But He warns us in His Word what is to happen in the last days. The great miracles worked before Jesus returns are done by Satan and his messengers. God will not contradict His Word. So many think they know better than God and God’s Word. Not satisfied with what God has declared in His Word, they seek another opinion. WHERE IS TRUTH TO BE FOUND? Not in the words of men nor their traditions. Do not depend on what any man–no matter how esteemed or learned or honored–tells you the Bible says. Determine for yourself. “Study to shew thyself approved.” 2 Timothy 2:15 Trust no man–including this one–for men can make mistakes. ALSO, Satan’s minions will appear as “ministers of righteousness.” (2 Corinthians 11:13-15) All information on this website is given for the exhortation and edification of the saints and for the glory of God. I could write a response as long as this page on how God has protected me for years over this one issue! When that began, I wasn’t even saved! It all started in the early 90s when my husband and I were attending a so-called Baptist church. They were very into the Toronto ‘blessing’ when it was in force at that time. It scared the living daylights out of me and was the cause of my leaving that congregation. Some of the ‘pastors’ even came to our house, trying to re-sell the thing to us, but I wouldn’t have it. I even got angry about it. Little did I know at that time that it was Christ’s protection. Isn’t hindsight, sometimes, a beautiful thing! Hindsight may be beautiful, but it’s nearly always 20/20 if we pay attention.